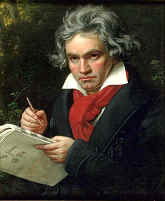 Beethoven's 5th Symphony was written in 1804 - 1808. At this time Beethoven had been deaf for around 8 years! It has one of the most famous openings of ANY piece of music. As soon as you put your first finger down on the second string, leave it there. It will make the playing much easier.